Take a jazz musician, a blues player, and a progressive rock lover and throw them in a blender. Actually, don’t do that. The results might be a bit too messy, and then we wouldn’t get to enjoy the awesome guitar work of Jane Getter. 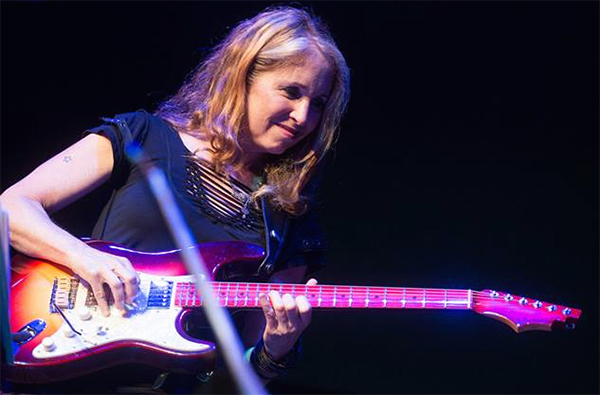 We were first turned on to Jane Getter’s fantastic guitar playing a few years ago, and in that time, she’s continued to release records and win accolades from everyone who takes the time to enjoy her infectious blend of jazz fusion, prog rock, and blues. 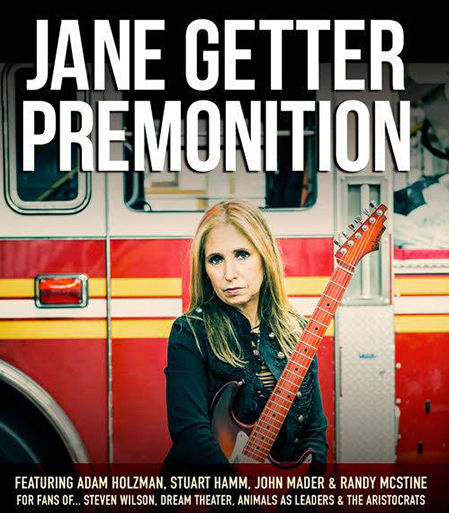 There are so few women in rock who climb to her level of guitar mastery, which makes it even more of a pleasure to talk about her latest release, On, from the Jane Getter Premonition. Her bands, both the studio lineup and the slightly different but equally impressive touring lineup, are comprised of jazz fusion and prog rock greats such as keyboardist Adam Holzman (Steven Wilson, Miles Davis), bassist Bryan Beller (Aristocrats, Joe Satriani), and drummer Chad Wackerman (Frank Zappa, Alan Holdsworth). On also features guitarist Alex Skolnick, who tours with the band (along with bassist Stu Hamm and drummer John Mader), not to mention other guest artists of impressive pedigree. We caught up with the New York resident just before she took the awesome Premonition tour to Europe. She’s an awesome talent with a lot to talk about. I went over to his shop and I played it and I was, like, Wow. This is it. This is like… I love this! MPc: Your music strikes an interesting balance between instrumental progressive rock and jazz fusion. I’d love to get an idea where your songwriting inspiration and style come from. JG: As you know, most of my background is in jazz. And my previous works were more jazz fusion than anything else, I would say. Although my last record, Three, was getting much more prog-rock-y, or prog-rock-ish, however you want to say. And the last few years, I’ve been listening more to albums like—I mean, artists like Animals as Leaders, Periphery, Porcupine Tree, Steven Wilson, that kind of stuff. And getting inspiration from bands like that—and Opeth, also. And considering my jazz background and jazz fusion background, my style ends up being sort of a combination of all of that, I guess. I still love fusion bands and jazz, too—like Mahavishnu, still listen to Mahavishnu and other fusiony-type bands. But the progressive metal and prog bands are ones that excite me more lately. MPc: Did you grow up listening to jazz or did you start out as a rock…? JG: Well, I started out as an acoustic player, folk music, actually. Although I did listen to rock, but I never… I didn’t have an electric guitar and didn’t really picture myself playing electric guitar. I don’t know if that’s because, being a girl and not having any role models at that time of women playing electric guitar, I mean, I don’t know if I just wasn’t hearing it then or the absence of role model or whatever, whatever played into it, I wasn’t really vibing on “I have to have an electric guitar.” I just had an acoustic guitar. And it was when I started playing jazz that I got my first electric. So I went from, I would say, the acoustic folk/blues kind of thing into a jazz, into straight-ahead jazz things. And then I started getting into the fusion and more rock stuff and so it’s been sort of a progression like that. MPc: And have you always been a New Yorker. JG: New Jersey, actually. But my parents are both from Brooklyn and so I have family all over the place. So, yeah, I guess, definitely New York-New Jersey, East Coast. MPc: Okay. Now, was that you providing the vocals on the track “Where Somewhere”? JG: Yes. That was me. MPc: I really enjoyed your vocals on the track, “Where Somewhere.” Have you ever considered recording a vocal album? JG: Well, my vocals thing is—well, thank you, I’m glad that you liked it, glad you enjoyed it—is still sort of in a developing stage, I feel. I mean, I had always—I’ve been singing backups in various bands over the years, but the singing lead thing just sort of started a few years ago with my album, See Jane Run. I have a singer on that album. And she worked with us for a few years but then we sort of had a parting of ways, although we’re still friends. I was looking for a singer and I played my demos for some people and they’re, like, “Why don’t you sing?” And I was, like, “Hmm. Okay, maybe I should sing.” So that’s when I started singing lead and I still feel like I have a long ways to go with that, but I am really enjoying it. I did used to sing when I was younger and played acoustic guitar. In fact, there’s a video that we just put out of me playing acoustic guitar and singing “Falling,” and I haven’t done that since high school, so that was pretty interesting. But doing a vocal album—I don’t write enough vocal material. As you noticed, my lyrics are pretty short. You know, I don’t get into lots of verses and choruses and pre-choruses and all that kind of stuff. I mean, it’s pretty straight to the point and fairly short. I’m a lyricist only to that point. I suppose that that could develop and could change at some point, but right now that’s where that is. And, basically, I’m a guitar player first. When I write the songs, I start them on guitar. And then they develop into, if there’s going to be vocal sections or not, if they’re instrumental, however they develop. But that’s a long way to say, long, roundabout way to say I have never really thought of just doing a vocal record, because I don’t feel that my voice is really strong enough to carry that at this point. But that could change, you know? MPc: Good. How did Corey Glover and Alex Skolnick get involved in the making of this record? JG: Well, Alex and I actually played another project together, so I know him from this other project. It’s a three-guitar—only three guitars: me and him and another guitarist named Bruce Arnold. And we’ve done some things. We headlined All-Star Guitar night at NAMM last year . So we have a really good rapport. And when I was writing this music and thinking about recording it, some of those sections have a lot of metal influences and metal aspects and I wanted something really authentic in there, you know, considering I’m not a real metal player. So I was, like, oh, he would be—he’s the perfect guy. Since we already know each other, we have a rapport. And he plays jazz, too. Corey Glover, I’ve been a fan of ever since Living Colour came out, and to me he’s got the perfect combination of R&B, gospel and rock, and blues in his voice. And it was sort of a dream for me to have him sing my songs. We contacted him and he said, yes. So that’s how that happened. MPc: Let’s talk about your guitar gear, starting with your choice of guitar or guitars used in the making of this record. JG: Sure. My main guitar that I used is made by a guitar maker in New York. His name is Paul Schwartz and the company is called Peekamoose. So it’s a Peekamoose guitar. It’s a Strat-style with humbuckers. And he is an authorized vendor and repairman in the city. When I was with Fender, they sent me to him to get my Strat worked on and I really liked his work, so I continued to bring him my guitars over the years, and then he just surprised me with this guitar one day. Because, he knew how I liked my guitars set up. He knew the kind of sound that I am looking for. And also, in terms of coloring of the actual staining of the guitar, he also knew what kind of colors I liked. So he just showed me this guitar he made for me, which was really fantastic. Other than that, I have a ’71 Tele that I used on “Train Man.” And I have a custom Strat with ‘60s—you know, built around, one of the ‘60s mods that Fender made for me when I first signed with them. So those three electric guitars are on there. Acoustic guitars, I have a ‘72 Martin D28, which has a beautiful acoustic, rich, rich sound. I also have a Yamaha AC3R that is on one song. I had just gotten it from Yamaha, and that’s got great electronics and it’s good for live playing. It also sounds good. Then I have an Ovation nylon string, which I got in the late ‘80s. So those six guitars are on it. MPc: Okay. Now let’s talk about amplifiers. I know you’ve had an evolution in the variety of amps you’ve been using over the last five to ten years. JG: Right, right. In fact, you were the one that suggested Fuchs to me, aren’t you? I tried some of his amps out and I really loved them. So, I got a Full House 50 with a 212 cabinet. And that’s the only amp I used on the album. And all the distortion sounds come from that amp except for the lighter distortion that I used on a couple songs, like the solo at the end of “Falling.” I used this Maxon Overdrive pedal that I think I got in the ‘90s somewhere. It’s got a nice, warm, round kind of sound, with just a little bit of extra edge to it. Just a little bit of a distortion, which was perfect for that song. I think I used it on a couple of different melodies, too. MPc: Your sound tends to be a pretty straightforward, bluesy kind of tone in general. Do you use many effects? JG: Well, we usually use—on the recording, I used the studio’s, obviously, some nice reverbs and some delays and some compression. I also used a wah-wah. I used that on “Logan,” on one of the tracks. But on my board, that’s generally what I use, what I have on my board when I play, I have a delay. I have actually two or three different delays that I use for different songs. Compression I use sometimes. I don’t use it too much, because I’ve been using this pedal called Distillery, which is made by ToneConcepts, and it’s sort like a pre-amp kind of pedal [that compresses the sound a bit]. So I don’t use the compressor when I use that. Have you ever heard of that pedal? MPc: No, I’ll be checking that out, though..
MPc: Do you make much use of your guitar’s volume and tone controls for altering your sound? Or are you pretty much a knobs-set-at-max kind of player? JG: I pretty much use a volume pedal for that. If I’m going to do swells or whatever, I use my volume pedal. And also I use the whammy bar on the two Strat-style guitars. And I do, actually I do have sort of a wiggly, flange-y kind of pedal that I use on some things. There’s some things on the recording that I used that on, too, I forgot to mention that. I have a TC Electronics chorus pedal that’s got a flanger in it, too. MPc: That’s the classic pedal, the stereo chorus flanger SCF? MPc: Love that pedal, hate the hardwired power cord. It’s pretty convenient, having a keyboard player like Adam Holzman around. JG: Okay. Well, this song, as in most of my songs, I would say, come out of a guitar riff or lick or idea or melody or something that—when I practice, I spend some time just sort of messing around, and I just come up with things that catch my ear. And then I kind of isolate that and then I develop that. And this song, the opening guitar-picking thing is where this song came from. And basically, just the first section of that was the original seed for the song and the song just developed from there. [Lyrically, it’s] about how surprised I am at how toxic and how messed up the whole political arena is right now that we live in, between the various parties in our political system. And some of the things that some of those politicians say and do and get away with. 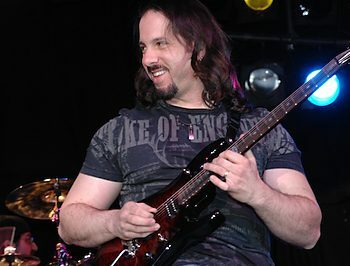 JG: So, I do this thing where I create my own scales and arpeggios and the opening picking thing, it was a pick… Two different arpeggios that I came up with which come out of different scales. They originally were just sort of exercises and just for warm up and they sound cool. And I decided to put those two together because they sounded good, one after one another. And they became, I sort of edited out the exercise aspect of it so that it sounds less like an exercise. And there’s actually three parts, three guitar parts on there. They’re together for a part of it, but then they have one or two notes that are different. So it sort of makes it sound like you’re not sure what’s going on there. And then… you probably hear the King Crimson influence in there, with those… have the different guitars going at the same time, then kind of going off on their own and stuff. And then the vocal section, I was hearing it go to another place like that and I had these things lying around… it was like, wow, this is perfect. This should go there. So I put that together. And then the heavy part came out of that, too, after the whole thing, the heavy part at the end. MPc: The song reminded me of Porcupine Tree. JG: I’ve been a fan of Porcupine Tree for years and love their stuff. Love what Steven’s doing, and has done. So I’m sure the influence is definitely in my writing, songwriting. MPc: How much do you write collaboratively with your keyboard player, Adam Holzman? JG: We don’t write together. We have never written a song together. We kind of—we give each other feedback and, as he is the co-producer on this album and my last album… actually, all my albums. You know, his ideas for a certain arrangement and stuff like that, that comes into it. But we’ve never really collaborated on a song together, writing a song together. JG: “Pressure Point,” let’s see. That’s another song that first, that riff, that line, that heavy line in the beginning, that was the seed for that song. That song actually had a whole other thing going on with vocals that I never really liked that much and so this is sort of an edited version of the original “Pressure Point,” which had another name and everything. When we’re playing it in the show, that’s going to be our opening song and there’s more solos than there are on the recording, sort of. So it will be a little bit longer in the live version than it is on the recording. MPc: Is Chad Wackerman still in your live band? JG: No, unfortunately, he is not really touring right now. The drummer that’s going on the road with us is a drummer out of Oakland named John Mader, and Stuart Hamm is touring with us, because Brian Beller [bass] is booked back-to-back, solid tours, between Aristocrats and Joe Satriani. Stuart Hamm is great, and Stuart and John have been playing together for a long time, and Stuart really liked him, he recommended him. And so we checked him out and we said, yeah, sure, this guy would be great. MPc: “Diversion” was a really beautiful blend of instrumental guitar rock with classic jazz. JG: Yeah, that’s also another, the seed came from those chords in the beginning. And it just developed from there. MPc: So in general, it sounds like half as many of your ideas start with a riff and others start with the chords. JG: That’s right, yep, yep. MPc: And then what about “Logan (would’ve sounded great on this)?” What’s that about? MPc: Do you write all of the bass lines for your songs, as well? MPc: Do you do that from your guitar or do you also pick up the bass? 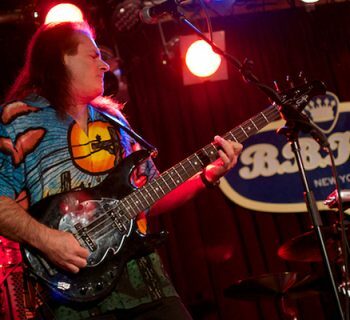 JG: I have a bass that I record—when I record my demos, on Logic, I play all the bass parts. But on some songs where there’s solo sections, I like it to open up and I like the bass player to stray away from the original bass line so that the music has somewhere to go. Because if it’s just the same bass line over and over again, that’s only cool for a while, but—and that might be what you want, that might be what I want. But on certain parts of the music, I want it to develop and grow into something else and then come back to the original bass line. So Brian does that in certain spots on the album… it’s pretty obvious. MPc: And so you do your demos in Logic, you were saying? MPc: And what do you do about the drums? JG: I program the drums. MPc: Okay. You are a musician of many talents here. JG: [laughs] I actually play a little drums. I love it, it’s so much fun. I have no chops, though. But I know how to come up with a groove, as long as it’s not too complicated. I program much more complicated things than I could actually play. But, yeah, I love playing drums. On my demos, I do everything. I do vocals, I do the keyboards, except for some of them have keyboard solos that I always say, “Hey, Adam, can you do a solo on here?” And he comes up and does a solo. It’s pretty convenient, having a keyboard player like Adam Holzman around. MPc: If you notice, I’m purposely avoiding making any references to a connection for purposes of the interview. MPc: Because I—I don’t know how much you guys publicize that… your marriage. JG: Yeah. We didn’t do it so much for a long time, but now we’re just, like, what the hell, y’know? Why not? And it’s kind of cool because of his exposure with Steven [Wilson], then it kind of makes the whole thing, our whole world bigger, you know? JG: [laughs] Yeah, okay, right, right. MPc: After all, most people had no idea until decades later that she was married to her guitar player. MPc: I forget, do you have children? JG: Yep, we have a son. Who’s a really good drummer, actually. Russell Holzman. MPc: So does he shake his head at those “crazy musician” parents? JG: Yeah. I mean, there are things about it that he really likes and there are things about it that he doesn’t like so much. But when he goes to see his dad play with Steven Wilson, he likes it a lot. [laughs] He’s a big fan of Porcupine Tree and Steven Wilson. 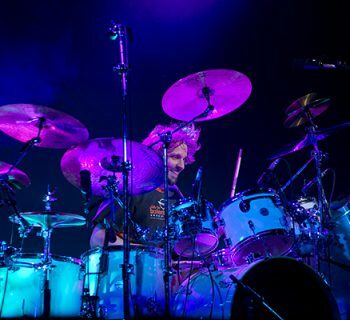 And Gavin Harrison’s his favorite drummer. MPc: Oh, my goodness. Missed that. Okay, let’s talk. Tell me more stories. JG: Okay, well, “Train Man” is about a homeless man that was sitting across from me on a New York City subway one day. I was just sitting there reading or something and I hear this shuffling of feet. And I looked down the car and there’s this guy walking onto the car. And he was just sort of talking to whoever was listening. And he sat down and he started to sing all this stuff, like “I’m going to write a book and I’m going to be rich and die”—a lot of the lyrics in the song actually come straight from his mouth. So he was sitting there saying all this stuff and I was, like, “This is a song.” So I was frantically trying to write down everything he was saying. And he says, “I’m never going to tell you why I’m wearing one black glove” and… he pretended he was talking on a cellphone. So, anyway, so that’s the story about the lyrics for that song and I put that together with a sort of a—it was actually those chords in the beginning of the song, sort of an idea that I had lying around. I often record ideas that I come up with on my guitar on my iPhone voice memos and I go back to that and then, I make a song out of that. And the heavy part is, the two sections, there’s the first part where the vocals are and then there’s the heavy section. And that was, you know the lyric how it goes, “I’m going to get rich and die”—to me that was a very intense statement and so I wanted to go into something intense and heavy. So that’s how that came about. And Alex Skolnick is on that and he takes the first solo and then I take the second solo and then we trade. It was really fun and really exciting, and it’s great when do it live, also. “Transparent” is about when you’re talking to someone and especially in the business world, they’re saying something to you but you know they mean something totally different. And they’re really phony. And so this song is about—you don’t have to do that, just be honest. I mean, it’s okay to be honest and that’s actually saves a lot of time, you know? JG: A lot of time, a lot of emails and a lot of phone calls. So that’s what that song is about. And I began writing that song when I was in India a few years ago, which is kind of interesting. That was my first Logic demo, that song. MPc: Cool. And now, you look back at… you’ve been a musician for quite a few decades. Do you think now is a better or worse time in our history to be a jazz musician? JG: I think the way the music business is now, I think it’s a worse time. I think that it’s like… because of the corporate aspect of the record companies which started a few years back. It wasn’t like the ‘70s when it was, record companies would develop artists… watch them grow and develop and gain bigger audiences as a progression. As opposed to now, if your first album doesn’t have a hit on it, then you’re out of there, y’know? And also the radio stations, how they’re so genre-specific, there’s a lot of music that still doesn’t fit in a specific genre, so there aren’t a whole lot of airplay options if your music is not totally genre-specific. But then the whole digital download, free music online, and all the people, a whole generation that doesn’t ever buy music, they just listen to it through free streaming services or YouTube or something like that. And that has really affected the musician’s chance of actually making a living making music. So I think in that respect, it’s not a great time. But if you’re a person that has to be a musician and is not happy doing anything else, then you have to figure out ways to deal with that and live with that and come up with ways [to make a living]. It’s not like you’re going to get those big advances with record companies anymore. MPc: Do you think the Internet makes it easier for you to find your audience than ever before? JG: I think it’s easier to get out to people that probably never heard of you before. But then there’s the whole lack of [financial support]. The touring thing is hard to do because record companies don’t offer tour support that much anymore. I mean, I’m talking about people that aren’t big names and have big, big budgets. The record companies don’t offer tour support anymore, so doing a tour can often be a money-losing venture. That used to be the way that you would gain audiences. And also the whole radio thing, which is not the same as it used to be. But the Internet is good in terms of reaching out to people, like in India or who knows where? Anywhere in the world. So that’s an exciting part. That is a good thing about it.